My new office takes me away from easy lunch-break access to the British Museum before I have completed seeing the History of the World in 100 Objects, but there is redemption in the form of the nearby Museum of London. Below are the first entries in what I intend will be a gallery-by- gallery guide, depending on how many lunch-breaks I can actually manage to eke out.. I have a rule of always visiting the city museum everywhere I go, as a way of gaining an understanding of a new place, and so I spent a lot of time in the Museum of London when I first moved to the Big Smoke. Yet until last week I always used to stride straight past the 'London Before London' gallery and start my visit in the Samuel Pepys era when, so I thought, the roots of modern London really began to form. the pavement coated with a transparent skin. out of the Vale of St Albans into the London Basin. on sheets of marigold, meadowsweet, mint. * The Carcassonne I refer to is a board game sold by the wonderful Spirit Games and popular with most of my board-gaming friends, but disliked by my goodself on account of the fact that I have never won at it and, I think, only once avoided coming last. Terry Jones spent many of his post Python year's studying in the British Museum to make the case that the Dark Ages were not so dark after all, and I was quite convinced when I read his book. However a quick shufty around the the Roman gallery at the Museum of London rather popped that balloon, with the revelation that London was abandoned for 400 years after the Romans left and was only re-inhabited when a desperate Alfred the Great's fleeing Saxon army sought refuge from Viking attacks behind Londinium's crumbling walls. It is hard to imagine why the Brits abandoned central heating, leisure centres and good wine for mud huts and mead, but maybe they just lost the manuals. 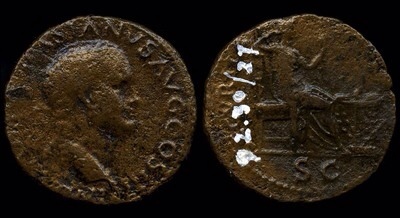 The Museum does a nice job in recreating life in imperial London, but as fans of Falco, Rome's greatest fictional detective, it was the well-preserved coins featuring the gumshoe's tight-fisted employer, Emperor Vespassian, that caught mine and Liz's attention. He looks serene, rather than scheming, but then I guess that's more the image for an all-powerful ruler on a copper coin. Wonderful. I want to hear more.